How to make spicy Mulaku Bajji / Banana Pepper fritters? Mulaku Bajji aka as Banana pepper fritters is a popular road side tea stall snack in South India. Its prepared by deep frying the batter coated banana peppers. Make a thick batter using besan flour, rice flour and baking soda with water as needed. Add chilli powder, turmeric powder and salt to the above batter and mix well using hand. Keep the batter idle for 30 minutes. Meanwhile wash the banana peppers and make a slit lengthwise on either sides but without separating at both ends. Heat oil in a frying pan and allow it to boil. When the oil becomes hot, dip/roll each bajji mulagu in to the batter and coat it evenly with the thick batter. Drop it carefully into the hot oil and flip both sides in between. Fry till both sides become golden brown and transfer to a plate with kitchen tissue paper. Enjoy it hot with red coconut chilly chutney. Batter should be thick enough so as to cover the banana pepper. 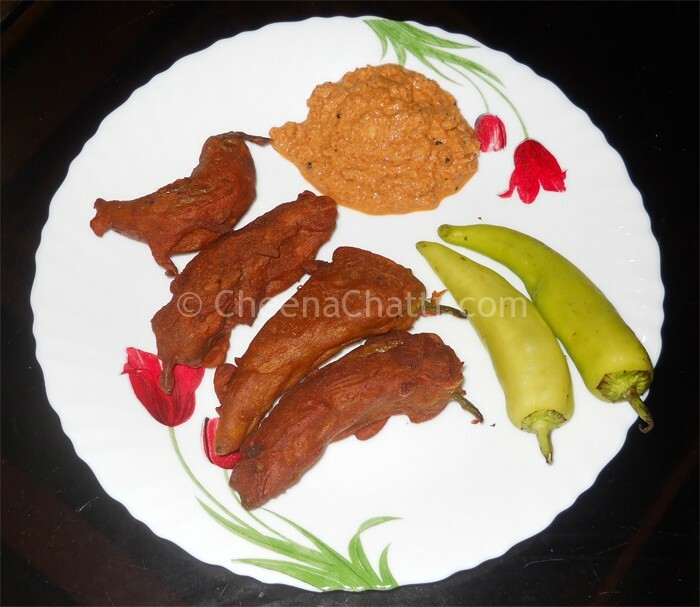 This entry was added on July 10th, 2013 by Renoos in Bakery and tagged with mulaku baji recipe, chilli bajji, evening snack, molaga bajji recipe kerala, chilli bajji recipe, molaga bajji recipe, snacks, mulaku bajji recipe, chilli pakora. Last revised on March 31st, 2018.
assalamualaikum, r u in face book? വളരെയതികം സന്തോഷം ആയി സജിത്ത്. മറ്റു വിഭവങ്ങളും പരീക്ഷിച്ചു നോക്കൂ ;).